Chief executive Ross McEwan often refers to fines and lawsuits from past scandals as ‘bumps in the road’. The state-backed lender has already navigated many of them, paying out more than £1.5billion in fines for rigging foreign exchange rates and Libor interest rates. By far the biggest ‘bump’ ahead is in the US and stems from the sale of financial instruments called mortgage-backed securities. These were effectively bundles of risky mortgages packaged up and sold to investors before the financial crisis. When the US housing market crashed, these investments imploded. RBS, like numerous other banks, is accused of misleading investors that these investments were a safe bet. One of those investors is the Federal Housing Finance Agency (FHFA), the US watchdog that regulates government lenders Fannie Mae and Freddie Mac. The FHFA is pursuing an £8.3billion settlement from RBS over £21billion of mortgage-backed securities sold in the run-up to the financial crisis. The US Department of Justice is seeking a separate settlement. Analysts predict RBS will have to fork out billions of pounds – and that this will constitute the vast bulk of between £2billion and £8billion it is expected to be forced to pay out in fines and litigation over the next three years. RBS has set aside £2.4billion for the mortgage-backed securities scandal, and so is likely to have to make further provisions. Ian Gordon, an analyst from Investec, said he hoped the issue will be resolved within the next 12 months. ‘This is the single biggest issue that clouds the investment case for investors,’ he said. RBS also faces lawsuits from investors around the world, including in the UK and the US, related to the foreign exchange and Libor scandals. RBS has racked up more than £50billion in losses since its £46billion bail-out in 2008. It has yet to make an annual profit and if it reaches settlements with US authorities this year with the DOJ and the FHFA, it is almost certain to rack up another big annual loss. But the real challenge Davies faces is how to boost profits in the underlying business. RBS has been drastically shrinking its investment bank, but this has hit both profits and revenues. 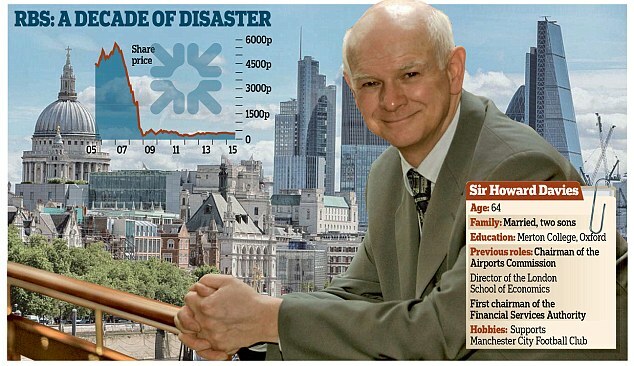 The investment bank is a conundrum that troubled Davies’s predecessor Sir Philip Hampton. He presided over a chief executive in Stephen Hester who embarked on a failed attempt to trade the bank out of trouble. Under pressure from the Treasury, RBS changed tack and has taken an axe to the investment bank, shedding thousands of jobs. Greenwood added: ‘Revenues for investment banking have become more difficult to come by and capital requirements have increased. One of the biggest headaches RBS has endured is meeting stricter rules forcing banks to hold more capital to protect themselves against future losses. But RBS has finally shored up its finances. The disposal of its US arm Citizens, which should be completed by the end of the year, will further boost its capital. The question facing Davies is when to return surplus capital to shareholders and in what form. It is likely to include paying dividends for the first time since it was bailed out, and share buy-backs, which would involve RBS buying back shares from the Government. RBS said this will not happen until the first quarter of 2017 at the earliest. The most pressing regulatory issue facing Sir Howard is the so-called ‘ring-fencing rule’ designed to make banks safer. Lenders are being forced to separate their high street retail operation from their investment arm by 2019. This will be extremely complicated and expensive. RBS will have to effectively create two businesses with separate boards, funding and IT systems. Incidentally, another big challenge is fixing the bank’s creaking IT systems after a series of major failures that has affected millions of customers. The ultimate aim is to finally sell taxpayers’ 79 per cent stake in RBS and return it to the private sector as a fit and profitable bank. The chancellor is anxious to kick off the process this year, and Davies will surely hope to be at the helm when it is completed. To achieve this he will have to address all the challenges listed above.